Our Special Education Needs (SEN) Department is very excited to announce that Broome Senior High School will be welcoming a Companion Dog, Hannah, into the school in 2018. 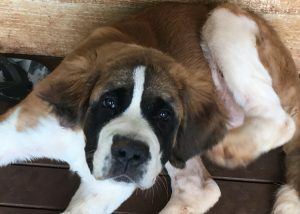 Hannah, a Saint Bernard, will primarily spend her time in the SEN classrooms and Student Services. Supporting positive education initiatives by helping to reduce student and staff stress and anxiety. Help students to develop empathy for other living creatures by giving them a chance to interact in a positive way with Hannah. Help promote community service through dog or other animal rescue charity fundraisers. We will be putting up displays and promoting animal rescue and fostering as part of a community service that students and parents may like to be involved in. We hope you are as excited as we are to welcome Hannah to Broome Senior High School.